In 1870, Dante Gabriel Rossetti published the first version of his sonnet sequence The House of Life. The next thirty years saw the greatest flourishing of the sonnet sequence since the 1590s. John Holmes's carefully researched and eloquent study illuminates how leading sonneteers, including the Rossettis, John Addington Symonds, Wilfrid Blunt and Augusta Webster, and their early twentieth-century successors Rosa Newmarch and Rupert Brooke, addressed the urgent questions of selfhood, religious belief and doubt, and sexual and national identity which troubled late Victorian England. Drawing on the heritage of the sonnet sequence, the poetic self-portraits they created are unsurpassed in their subtlety, complexity, courage, and honesty. 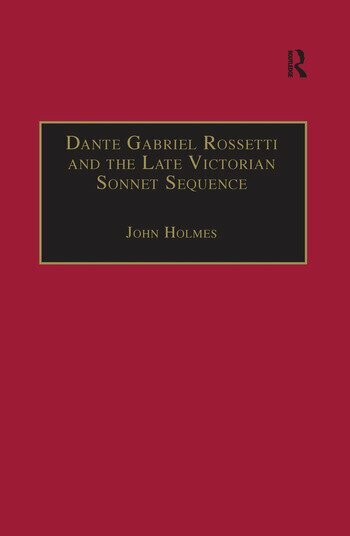 Contents: Preface; Introduction: Rossetti, the sonnet sequence and the late Victorian self; Dante Gabriel Rossetti's inclusiveness: method and meaning in The House of Life; The sons of Gabriel; Christina Rossetti replies: Monna Innominata and Later Life; From sexuality to sexualities: Marzials, Barlow, Blunt and Symonds; Female identity in transition: Gregory, Webster and Newmarch; Structures of the self: dialectic and myth in John Addington Symonds's Animi Figura; From Rossetti to Rupert Brooke: the self and the nation; Appendix; Bibliography; Index. Dr. John Holmes is Lecturer at the School of English and American Literature, University of Reading, UK.